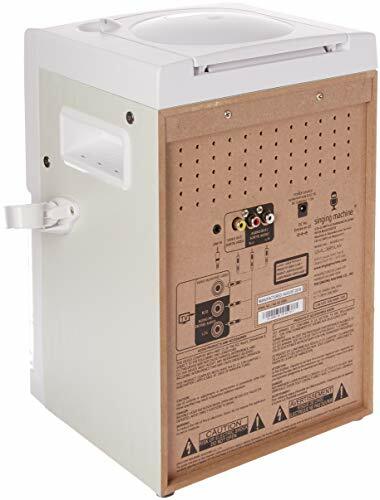 A karaoke machine is a fantastic addition to any party, and the SML385BTW is a good way to go if you’re looking for an option that’s affordable without sacrificing too much in the way of quality. It’s definitely been designed with a younger audience in mind, and – for the demographic – it definitely succeeds. We recently spent some time testing it out and basically demonstrating that we have no singing ability whatsoever to anyone unfortunate enough to be within hearing distance. 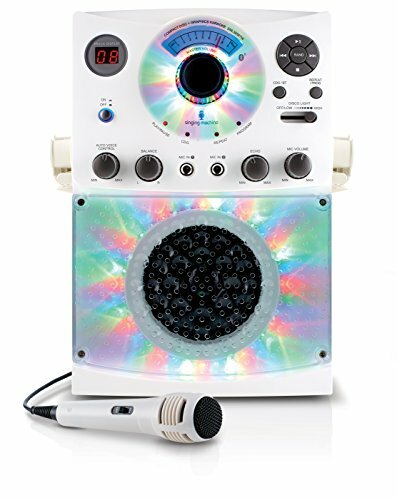 Well, this machine is more or less what you’d expect for a fun-sized, sub-$100 karaoke box. It has a top-loading disc reader, which can take both CD and CDG discs. Likewise, it also supports Bluetooth audio streaming (which we were a little surprised about for a machine in this price range), and it has a built-in speaker which provides surprisingly decent sound quality. Aesthetically, it’s neither particularly beautiful nor hideous – there’s an array of LED lights on the front, and these can be controlled using the machine’s dimmer switch. It’s got a two-digit LED display for letting you know the current CD track number, and there’s also a variety of inputs and buttons, too. One function we did like was the ‘random’ playback button, which – as you probably guessed – selects a random track on the current disc. It’s hardly groundbreaking, but could make for a useful function if you’re ever unsure about what you actually want to sing along to. 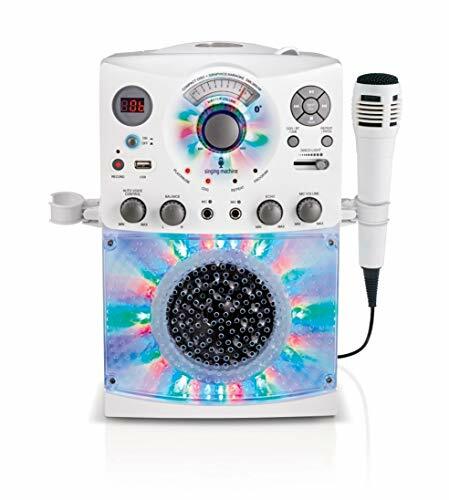 In terms of connectivity, you really can’t ask for much more than this karaoke machine provides – especially considering the price. As well as wireless streaming, there’s a line in input, too – this is useful if you want to skip the sometimes cumbersome nature of Bluetooth and just play music as simply as possible. That said, you’ll need to provide your own auxiliary cables if you’re wanting to do this (although you can easily pick them up on Amazon for a few bucks). The front of the unit has several knobs for controlling balance, the loudness of your voice, and “auto voice control” (which basically attempts to automatically determine the volume of the singer’s voice and the current song, with varying degrees of success). Funnily enough, there’s also a dial for controlling echo, but this is mostly a pretty novel feature unless you’re singing along to Zeppelin or someone else a little more “heady”. There are two microphone jacks, but it is worth noting that you’ll only receive one mic with the unit. It’s not a huge inconvenience, as you can purchase an identical one via the Amazon product page for ten bucks, and that’s a pretty fair deal to be honest. The side of the machine has two microphone holders, which seem a little precarious in their attachment – a slightly better build quality would go a long way here, but it’s not as if the integral function of the machine is going to be affected if they do come away (and they could be re-attached with relative ease, anyway). With all that said, it’s really hard to knock this karaoke box. It might lack a built-in screen, but for the most part we streamed lyrics videos from YouTube and simply read them off of our iPad. It’s a machine for kids, and everything about it – from the build quality to the overall design – makes that clear. That said, as far as karaoke machines for kids do go, this really isn’t a bad effort.